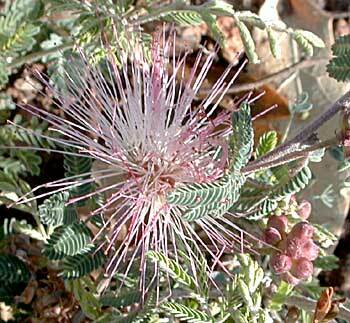 Other names: Calliandra, false mesquite, hairy-leaved calliandra, mesquitilla. Notes: Each pink puff contains several flowers,having long stamens, tipped with pink and white at the base. These are followed by flat, brown seed pods which split open when ripe, the halves standing wide apart. This plant is thornless and binds the soil. 3 species of Calliandra in Arizona.